Wardens Kris MacCabe and Rick LaFlamme took part in a demonstration at the school. 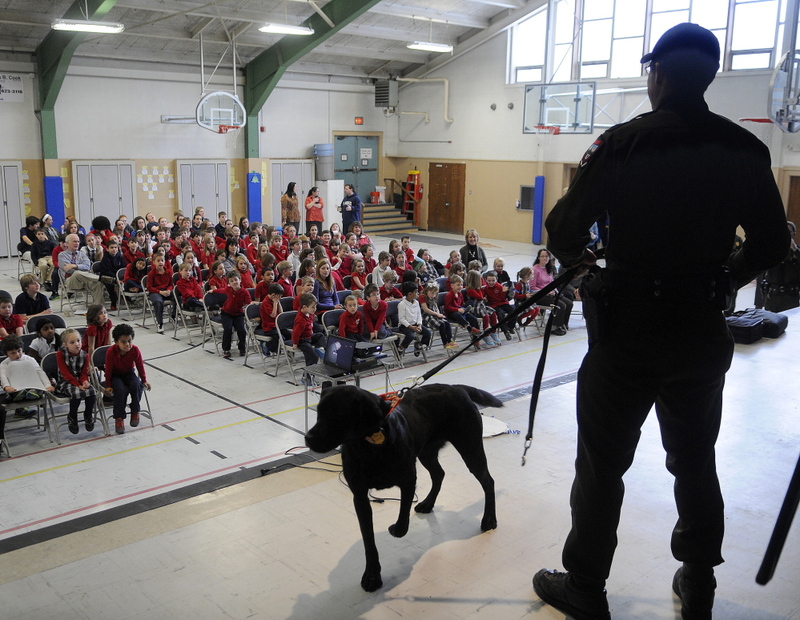 AUGUSTA — Game Wardens Kris MacCabe and Rick LaFlamme may be the most recognizable figures on the television series “North Woods Law,” but it was MacCabe’s Labrador retriever, Morgan, who captivated the students during Wednesday’s visit to St. Michael School. “Morgan always steals the show,” LaFlamme quipped. A couple hundred pre-kindergarten through eighth-grade students gathered for the schoolwide assembly, which began with a preview of the upcoming season. Students pointed and giggled when their friends flashed on the screen during the fast-moving video clips. Much of the assembly was devoted to a question-and-answer period. Students asked a host of questions about how to become a game warden and the most interesting cases the men had handled, but a vast majority of the questions centered on Morgan. The students wanted to know everything from the dog’s age to how she is trained. Morgan, apparently, ate up the attention, as she wiggled incessantly at MacCabe’s feet and even barked, much to the children’s delight. At one point MacCabe and Morgan demonstrated their skill. MacCabe hid some items on the stage and Morgan set about finding them, the students giving the duo rapt attention. MacCabe, who grew up in Monmouth, said one of his more memorable moments was using a Tupperware box to capture a loon. It turns out that televising the wardens as they carry out their duty also is a big deal. Cpl. John MacDonald, who accompanied MacCabe and LaFlamme, said about 30 million people have watched “North Woods Law.” An informal poll of the St. Michael students indicated about two-thirds of them have seen the show. MacDonald said the show is popular among elementary school-age students. “These kids seem to be most energetic about the show,” MacDonald said. LaFlamme said MacDonald, the Warden Service’s information and education officer, has played a crucial role in making the show a reality, but MacDonald has never appeared on the show. “I’m not Rick LaFlamme or Kris MacCabe, but at least my name is in the credits,” MacDonald said.